1997/2002: Post-doctoral research in the laboratory of Professor Philippe Gros, Department of Biochemistry, University McGill, Quebec, Canada. MACROPHAGE IRON METABOLISM AND PATHOLOGIES. 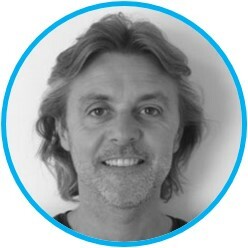 ​My research focuses on mammalian iron homeostasis and in particular in the key processes of heme iron storage and recycling from aged or damaged red blood cells by macrophages. For this purpose I developed a physiological model that mimics the process of erythrophagocytosis including red blood cells ageing, recognition and engulfment by macrophages. 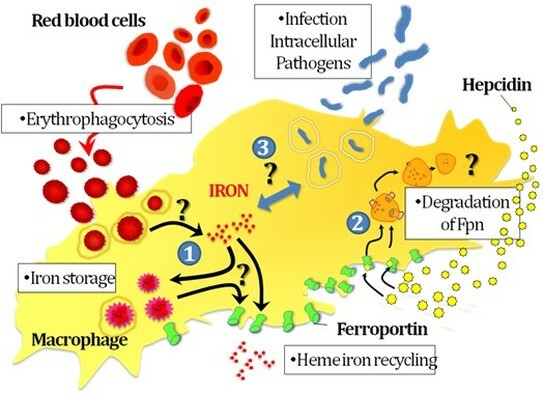 Using this model, we studied the different steps of heme iron recycling by macrophages①. We clarified important regulation at both mRNA and protein levels of Ferroportin (FPN), the only mammalian iron exporter identified to date. We also showed that Hepcidin (HAMP), a small peptide considered as the major hormonal regulator of iron homeostasis, induces a rapid internalization and degradation of the macrophage iron exporter present at the cell surface of macrophages. To get insight into the molecular mechanisms involved in HAMP mediated downregulation of FPN protein, we developed cellular and proteomic approaches to better define the environment of FPN in macrophage cellular membranes②. We are currently studying the relation between macrophage iron recycling, infection with intracellular pathogens (such as salmonella) and anemia of inflammation③. In the context of antibiotic resistance, understanding the role of iron in human bacterial infection represents an important research challenge to identify new therapies against bacteria. 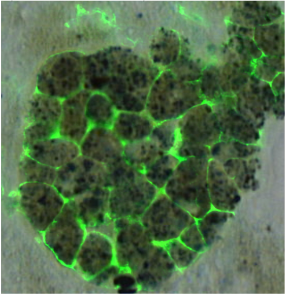 In the infected host, the sequestration of iron in macrophages is thought to limit extracellular bacterial growth but also contributes to the development of the anemia of inflammation. However, for intracellular bacteria which proliferate in macrophages, growth benefit and toxicity could be two sides of the same “iron” coin and this host-pathogen response is currently a matter of debate. 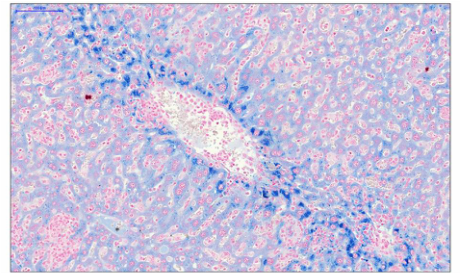 Our research is design to assess the interplay between systemic and macrophage iron homeostasis with the intracellular pathogen Salmonella typhimurium. Our goal is to get insight in the physiopathology of human bacterial infection and in the etiology of the anemia of inflammation. Deschemin JC, Noordine ML, Remot A, Willemetz A, Afif C, Canonne-Hergaux F, Langella P, Karim Z, Vaulont S, Thomas M, Nicolas G. (2016) The microbiota shifts the iron sensing of intestinal cells. FASEB J. Jan;30(1):252-61. Marques L, Negre-Salvayre A, Costa L, Canonne-Hergaux F. (2016) Iron gene expression profile in atherogenic Mox macrophages. Biochim Biophys Acta. (6):1137-46. Auriac A, Willemetz A, Canonne-Hergaux F. (2010) Lipid rafts-dependent endocytosis: a new route for hepcidin-mediated regulation of ferroportin in macrophages. Haematologica. (8):1269-77. Meynard D, Kautz L, Darnaud V, Canonne-Hergaux F, Coppin H, Roth MP. (2009) Lack of the bone morphogenetic protein BMP6 induces massive iron overload. Nat Genet. 41(4):478-81. Delaby C, Pilard N, Puy H, Canonne-Hergaux F. (2008) Sequential regulation of ferroportin expression after erythrophagocytosis in murine macrophages: early mRNA induction by heme followed by iron-dependent protein expression. Biochem J. 411(1):123-31. Delaby C, Pilard N, Hetet G, Driss F, Grandchamp B, Beaumont C and Canonne-Hergaux F. (2005) A physiological model to study iron recycling in macrophages. Exp Cell Res,310(1):43-53. Canonne-Hergaux F, Gruenheid S, Ponka P, Gros P. (1999) Cellular and subcellular localization of the Nramp2 iron transporter in the intestinal brush border and regulation by dietary iron. Blood. 93(12):4406-17.